No Program selected -How do I select a program -How do I do a Freestyle workout? 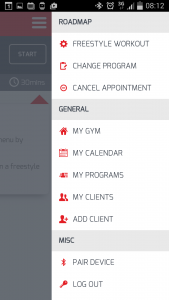 This guide will help you select a program if you currently do not have one and are in “Freestyle” mode. Step 1: Open the application and on the dashboard it displays No Program Currently selected. 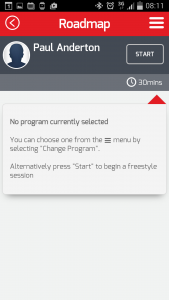 If you have no program selected you can simply press “Start” and the system will assume “FreeStyle” mode (Refer to the guide on “FreeStyle” workouts) – Or You can select the menu and choose program using “Change Program”.